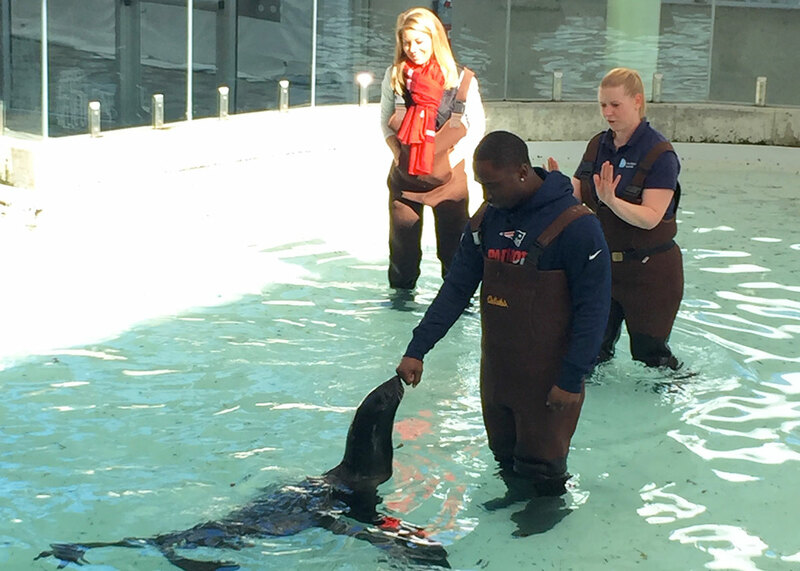 Several weeks ago, before the injuries started stacking up against the Patriots, star running back Dion Lewis came to the Aquarium to engage in a friendly challenge with new Channel 7 news anchor Jadiann Thompson. Coached by marine mammal trainers Belinda Brackett and Jamie Mathison, the two spent more than an hour learning the ins and outs of working with sea lions and fur seals. Dion Lewis works with Ursula the fur seal. 7 News anchor Jadianne Thompson and trainer Belinda Bracket looks on. The lesson was part of a segment that aired on 7 News morning show called "Who Did It Better?" Take a look! Who do you think did it better?